Our recent appeal was highly successful, with many generous personal donations and a National Lottery grant. A stalwart member of the villager navigated their way through planning permissions and Historic England scrutiny to get us the go-ahead. We were ably assisted by Mark Roberts, an eminent archaeologist of 'Boxgrove man' fame, who got down on hands and knees to excavate the surface soil of the ancient monument. 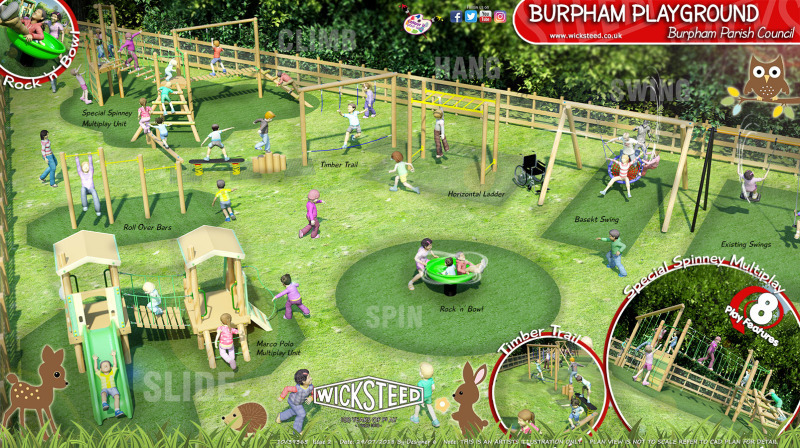 The playground was donated in the 1960s by the Valentine family, who still have a house in Burpham, and it was refurbished in 1997 by the Village Committee. 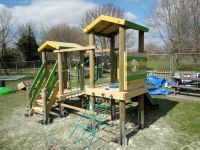 Now it is the turn of the third generation to carry on this wonderful play space with its views across the valley to Arundel Castle. We want to create an exciting environment for our children and grandchildren to enjoy the outdoors in the wonderful rural setting of this Ancient Monument. We contracted Wicksteed to provide the scheme, and work started on 25th March. 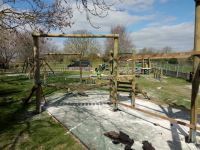 We have installed a Toddler Tower, and some exciting agility equipment for older children, a rocking bowl, and a nest swing for disabled youngsters. We have kept the original swing, and refurbished the fencing. We'll be putting in a new rubber surfce shortly, when the playground will be ready to use. We will also be re-painting the commemorative bench. We have set up a Facebook site where we will provide updates. Please 'like' our page and share it with friends. We have been bowled over by support from people who played here as children and who have fond memories, even though they no longer live here.